THIRTEEN W.E. 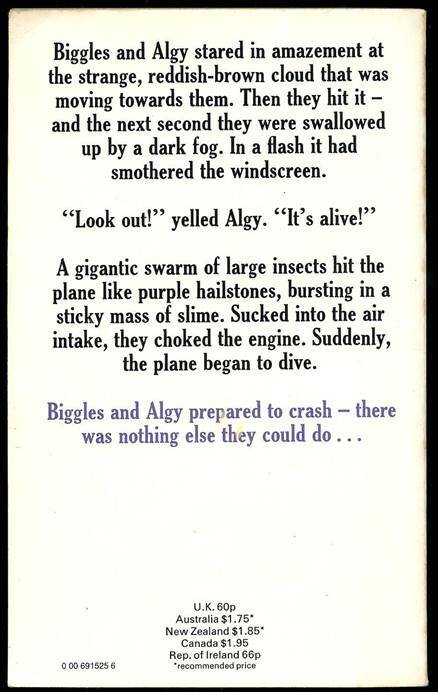 JOHNS BIGGLES BOOKS WERE PUBLISHED BY “ARMADA” WITH THE DISTINCTIVE WHITE COVERS AND A RED LOGO WITH “BIGGLES” IN WHITE TEXT AS SHOWN ABOVE. 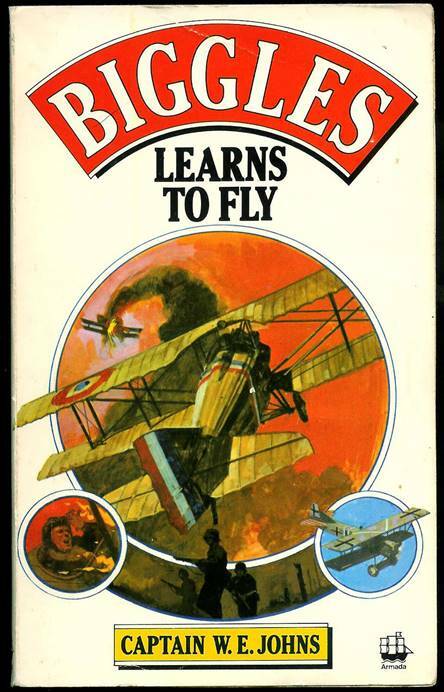 Originally published in 1935 – This paperback was ORIGINALLY published by Armada in 1963. 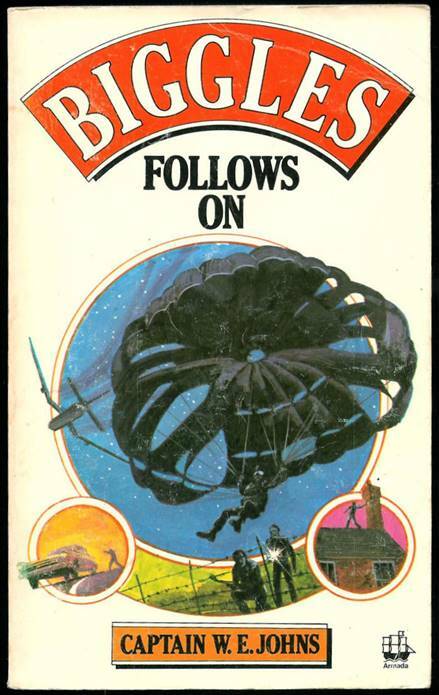 This version of the paperback was published in 1979. (This book still erroneously says that this was first published in 1935 by Brockhampton Press but it was, in fact, published by the Amalgamated Press in 1935 and then reissued by Brockhampton Press in an amended version in 1955). The text was reprinted using the same printing plates although the last page, 160, is unnumbered in this reprint. 160 pages. No cover artist is credited. This book contained 9 original illustrations done for this book by an uncredited artist. They are on pages 4, 14, 23, 48, 83, 99, 119, 126 and 140 and are mainly small drawings at the end of chapters, with the noticeable exception of the frontispiece at page 4. Originally published in 1948 – This paperback was ORIGINALLY published by Armada in 1963. 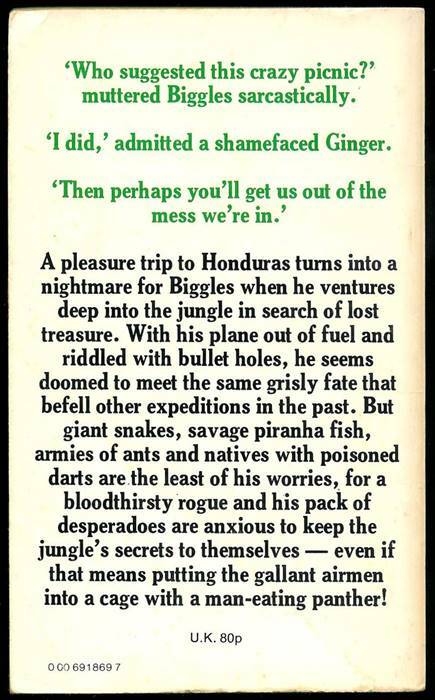 This version of the paperback was published in 1979 and then reprinted in 1983. The text was reprinted using the same printing plates although the last page, 159, is unnumbered in this reprint. 159 pages. No cover artist is credited. This book contained no original illustrations. Originally published in 1940 – This paperback was ORIGINALLY published by Armada in 1963. 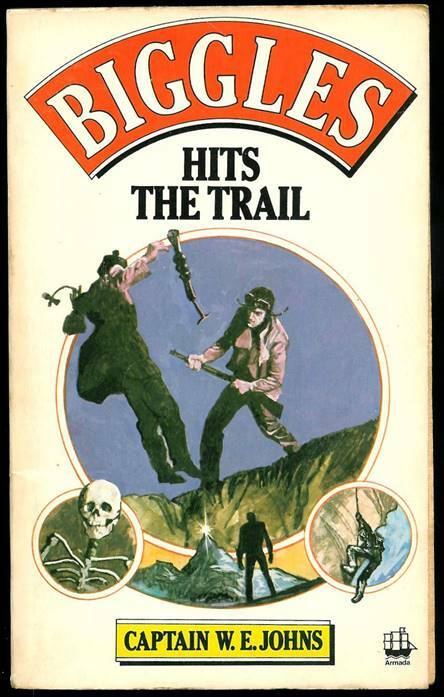 This version of the paperback was published in 1979. The text was reprinted using the same printing plates. 158 pages. No cover artist is credited. 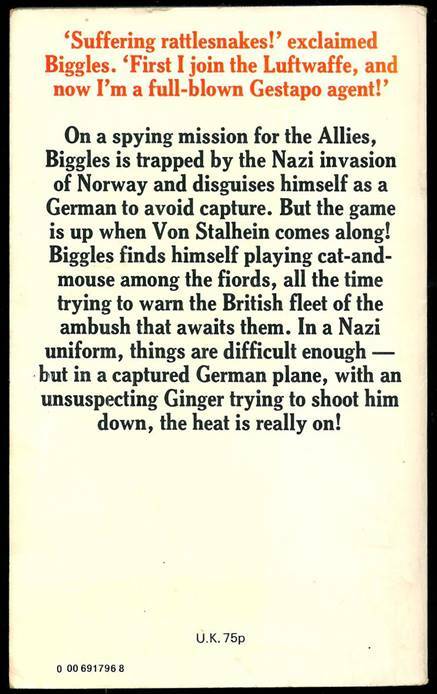 Originally published in 1943 – This paperback was ORIGINALLY published by Armada in 1962. 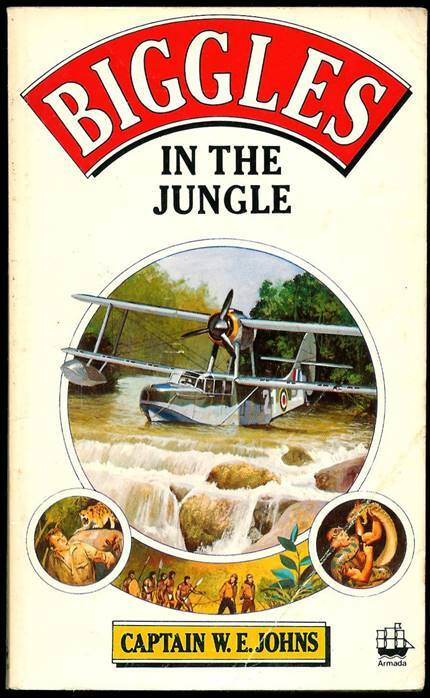 This version of the paperback was published in 1979 and then reprinted (at a higher price) in 1983. The text was reprinted using the same printing plates. 158 pages. No cover artist is credited. This book contained 4 original illustrations done for this book by an uncredited artist. They are on pages 11, 41, 69 and 135. These are remarkably similar to the four original illustrations by Mendoza from the first edition of this book. The hyphen between “Biggles” and “Charter” has now been re-inserted back on the spine. 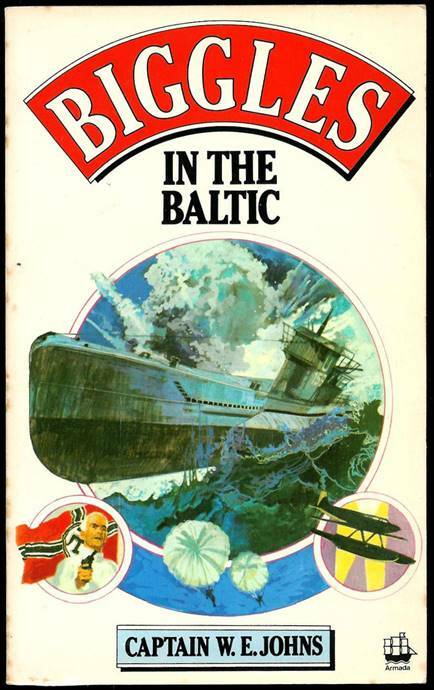 Originally published in 1952 – This paperback was ORIGINALLY published by Armada in 1972. 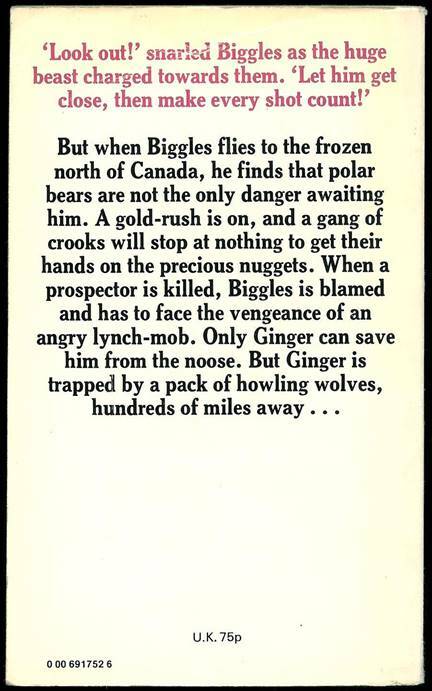 This version of the paperback was published in 1980. The text was reprinted using the same printing plates. 127 pages. No cover artist is credited. 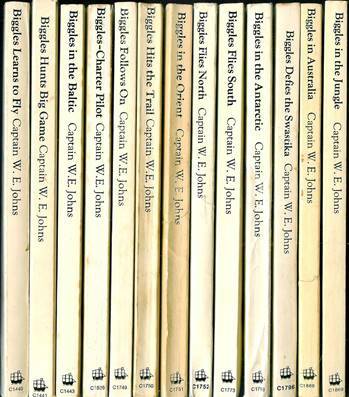 Originally published in 1935 – This paperback was ORIGINALLY published by Armada in 1962. (This book still erroneously says that this was first published in 1941). 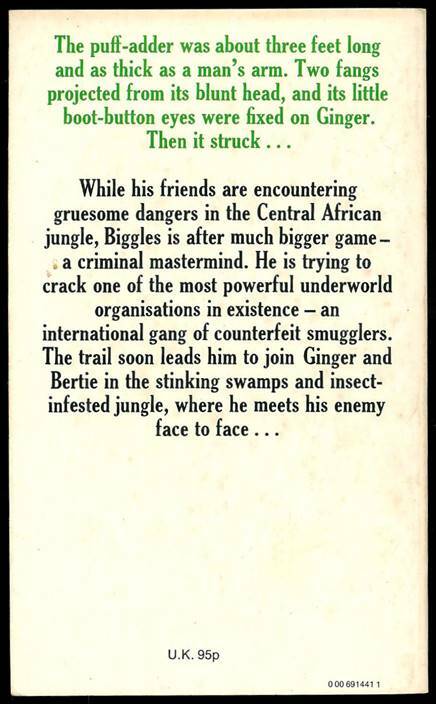 This version of the paperback was published in 1980. The text was reprinted using the same printing plates. 160 pages. No cover artist is credited. This book contained 4 original illustrations done for this book by an uncredited artist. They are on pages 11, 43, 107 and 147. 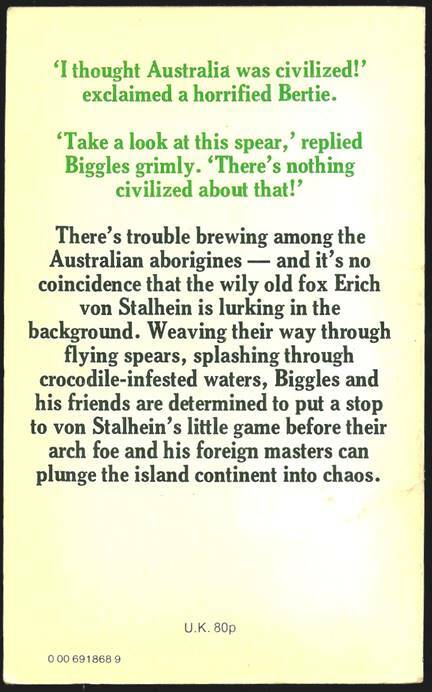 Originally published in 1945 – This paperback was ORIGINALLY published by Armada in 1963. 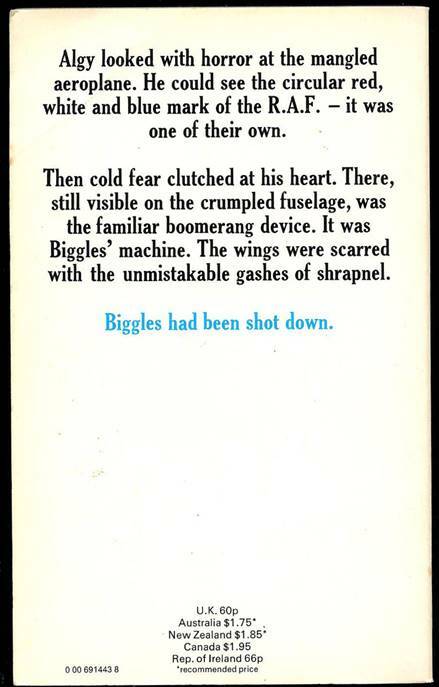 This version of the paperback was published in 1980. The text was reprinted using the same printing plates. 160 pages. No cover artist is credited. The original Armada paperback book contained no original illustrations but the 1965 and 1969 reprints contained one illustration – a frontispiece on page 4. This book also has that frontispiece. No artist is credited. 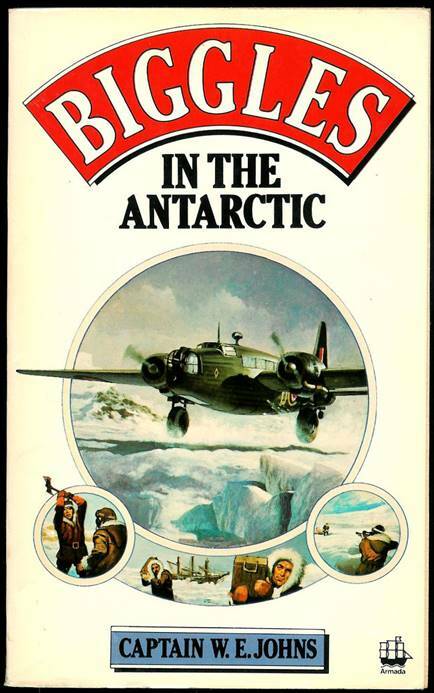 Originally published in 1939 – This paperback was ORIGINALLY published by Armada in 1966. 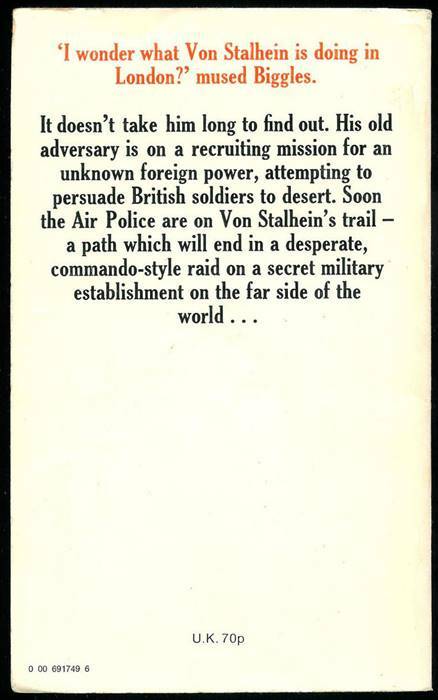 This version of the paperback was published in 1980. The text was reprinted using the same printing plates. 157 pages. No cover artist is credited. the first edition by WILL NARRAWAY, however what was originally the third illustration was moved to be a frontispiece. The illustrations are on pages 4, 38, 63, 103, 119 and 141. 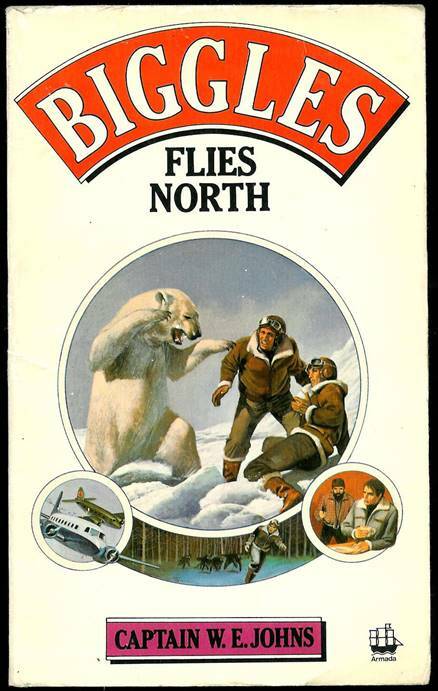 Whereas in previous editions of the Armada paperback of “Biggles Flies North”, the artist was credited, here WILL NARRAWAY is NOT credited. 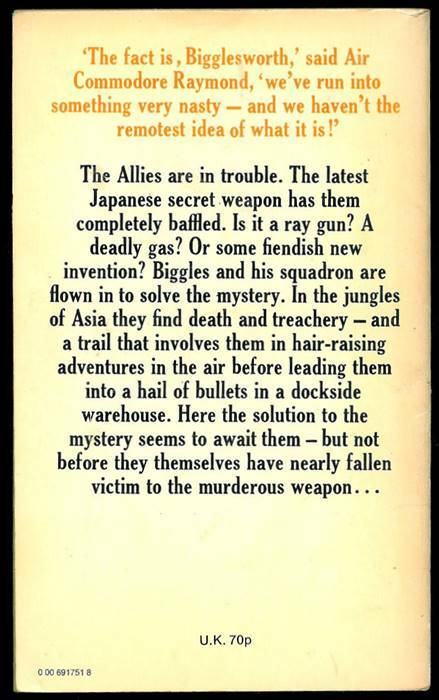 Originally published in 1938 – This paperback was ORIGINALLY published by Armada in 1966 (although the details in the book erroneously say 1969, which was the year Armada reprinted it). 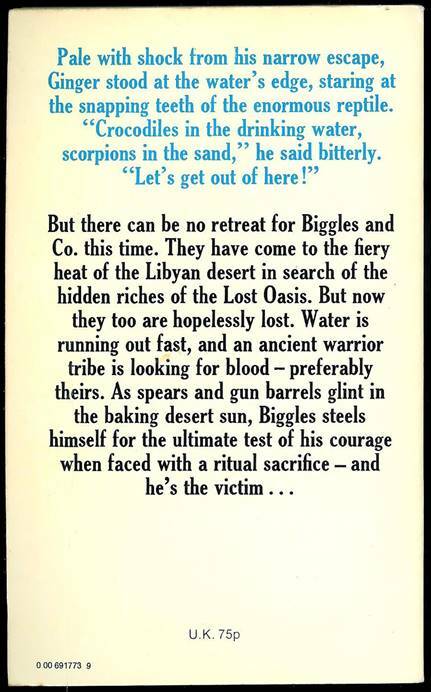 This version of the paperback was published in 1980. The text was reprinted using the same printing plates. 158 pages. No cover artist is credited. 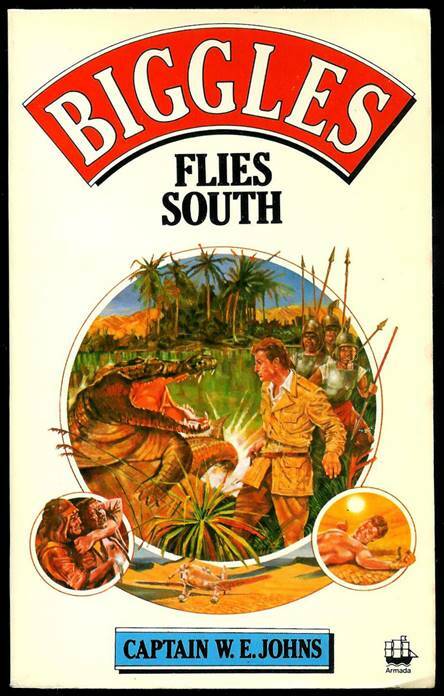 the first edition by JACK NICOLLE – plus the map. They are on pages 4, 38 (the map), 69, 87, 126 and 147. You can see all the first edition illustrations by clicking on the rear cover. The first illustration after the map is the missing one. The third illustration of Ginger being attacked by a crocodile was moved to be a frontispiece. 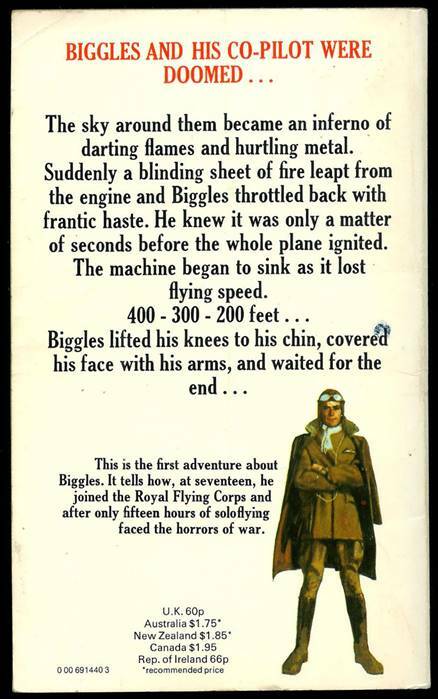 Originally published in 1949 under the title “BIGGLES BREAKS THE SILENCE” – This paperback was ORIGINALLY published by Armada as BIGGLES IN THE ANTARTIC in 1970. 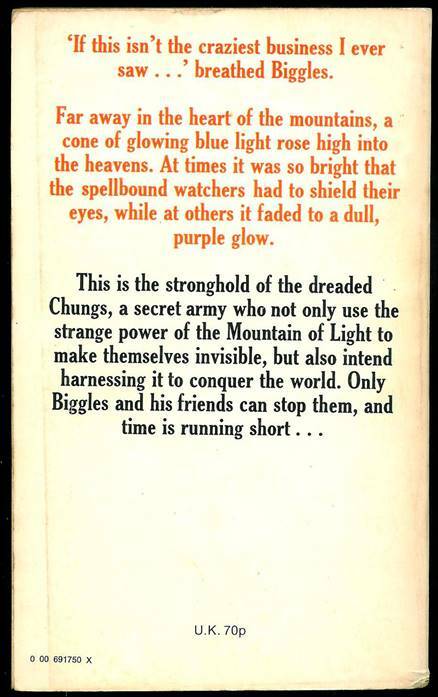 This version of the paperback was published in 1980. The text was reprinted using the same printing plates. 158 pages. No cover artist is credited. The first Armada edition of this book featured a note on page one saying the story is based on fact, although the rediscovery of the treasure is fictitious. This note is NOT reprinted in this edition of the book. 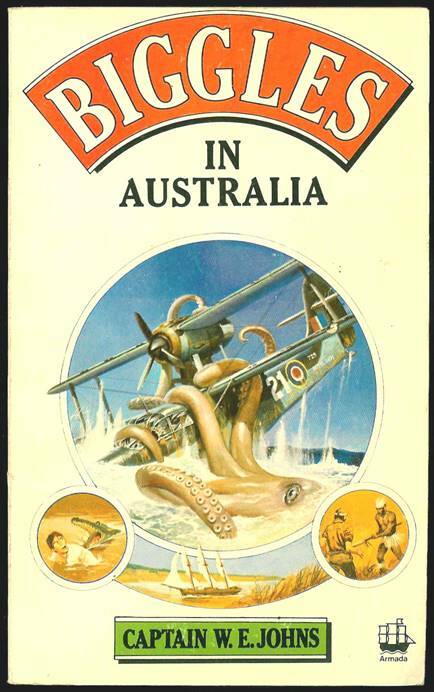 Originally published in 1941 – This paperback was ORIGINALLY published by Armada in 1962. 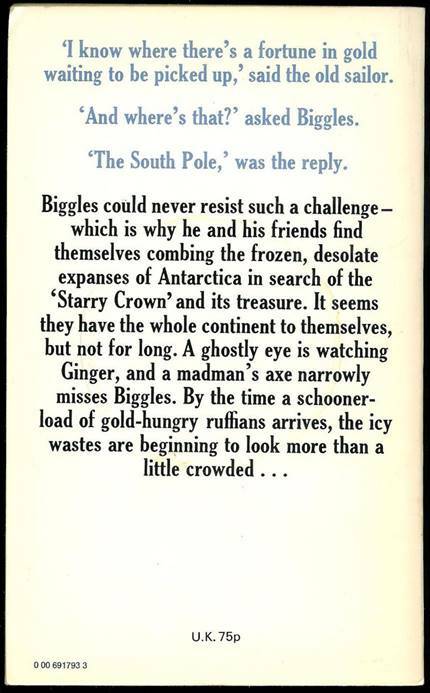 This version of the paperback was published in 1980. The text was reprinted using the same printing plates. 159 pages. No cover artist is credited. This book contained 4 original illustrations done for this book by an uncredited artist. They are on pages 9, 62, 79 and 152. Originally published in 1955 – This paperback was ORIGINALLY published by Armada in 1970. 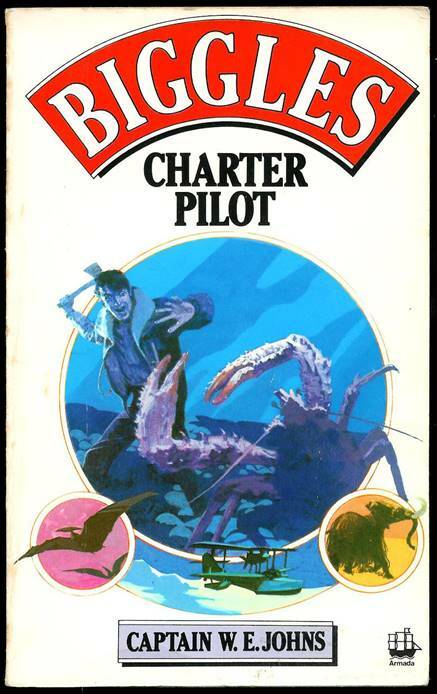 This version of the paperback was published in 1981. The text was reprinted using the same printing plates. 126 pages. No cover artist is credited. 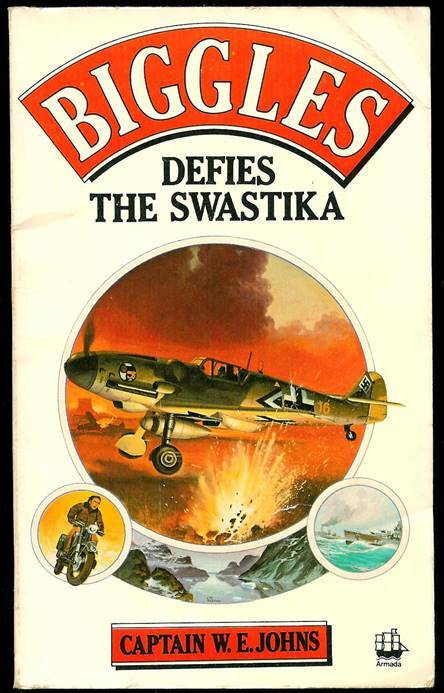 Originally published in 1942 – This paperback was ORIGINALLY published by Armada in 1966. 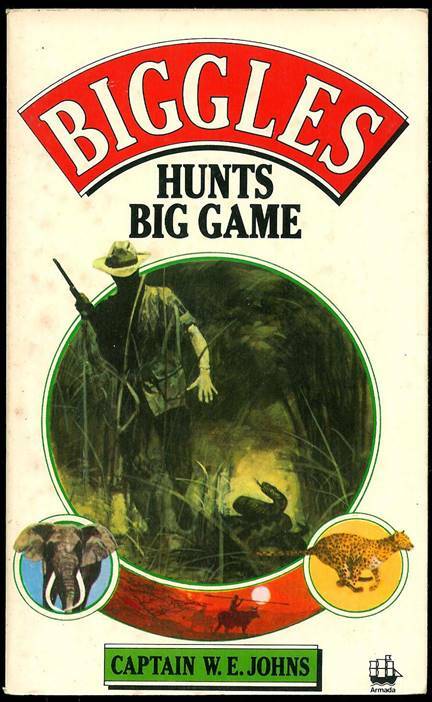 This version of the paperback was published in 1981. The text was reprinted using the same printing plates. 157 pages. No cover artist is credited. 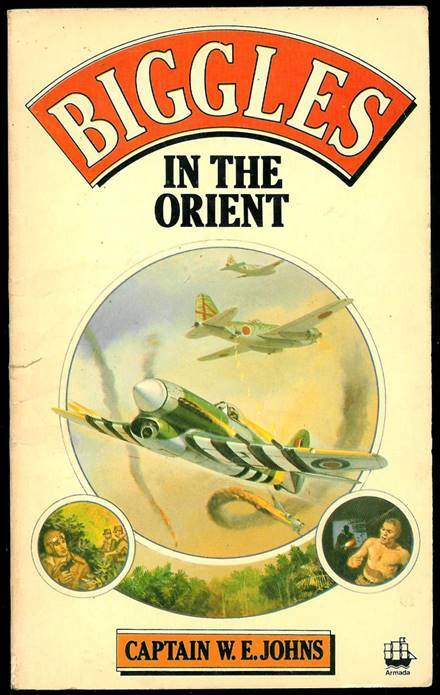 This book contained the FOUR original illustrations from the first edition by TERENCE CUNEO. They are on pages 18, 61, 100 and 152.